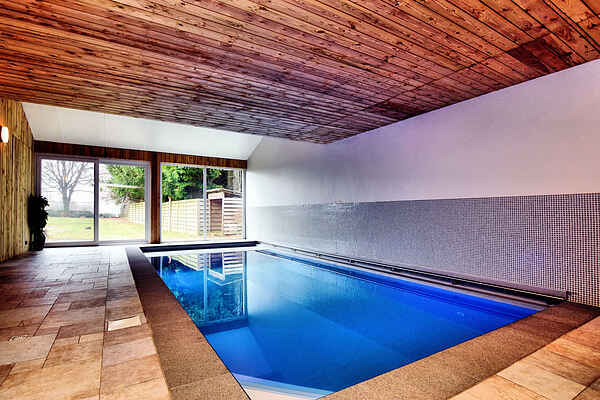 This large, superior quality holiday home with indoor pool and sauna is perfect for a holiday with the whole family. The holiday home, which consists of two buildings, lies at just two kilometres from the High Fens nature reserve, where peace and tranquility prevail. You won't get bored here! During the winter you'll spend wonderful evenings with the whole family in the living room by a crackling fire. After a day in the outdoors you can retire to the indoor pool, sauna or Jacuzzi, all of which can be found in the annex. The children can enjoy themselves in the TV room, the large closed garden or the communal playground opposite the holiday home. This holiday home is aimed at families. For your daily shopping you'll go to Malmedy, where you'll also find some excellent restaurants, quaint shops and cosy cafes. From the house you can take a nice walk to the castle of Reinhardstein, which is on the Robertville lake. In Ovifat, 5.5 km away, you can go skiing and cross country skiing in the winter, if there's enough snow. The towns of Stavelot (15 km) and Spa (19 km) are also worth visiting.